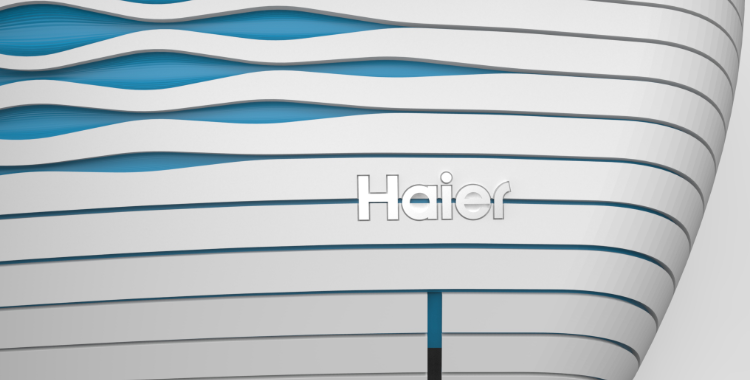 Upon commission by Haier Group in December 2014, our team developed the design of an interior AC Unit chassis (to be realized entirely via 3D printing), to be exhibited at the upcoming AWE – Appliance & Electronics World Expo in Shanghai, March 2015. To date there was no precedent in the use of 3D printing for home appliances at the given scale (typically an interior AC Unit has a bounding box of 100x30x40 cm), so what we developed turned out to be a world’s first. The target market sector indicated by the client for our design was high-level/luxury (due to the prototypical nature of the project and the current cost of 3D printing at the desired scale), not mass production: tag price was constrained, although not a primary issue. The designed chassis had to fit the core of an existing design unit and be fully functional during the exhibition.
. production system does not depend anymore on stock making and previsions, as the production matches exactly the order (one ordered, one produced). The cost previously invested in stock can be saved or invested in further design and user customization expression, stressing once more the importance and opportunities at the hand of the designer. Although our first approach and intentions were more radical in re-thinking, evolving and integrating form and function through additive fabrication technology, in order to meet the steep time schedule and the given constraints we agreed with the client to focus mainly on the perceptual qualities of the object in relation to the user experience. The design has a streamlined quality in order to solve surface continuity among the various parts and tries to absorb and integrate as surface pattern qualities the necessary functional adaptations to air intake, air flow and back lit display. The system is designed to be customizable by the client in terms of pattern configuration and color choice prior to the production of the object.